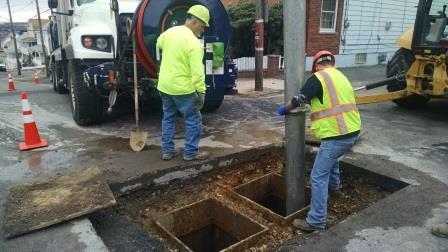 The GHJSA has acquired the sewage collection systems of the City of Hazleton and Borough of West Hazleton effective January 1, 2013. A Collection System Division of the Sewer Authority has been formed to maintain and systematically upgrade the sewage collection system. The GHJSA has already begun mapping, televising, smoke testing, and flow monitoring in parts of the system to maintain compliance with a Department of Environmental Protection (DEP) mandated Corrective Action Plan (CAP). The acquisition includes all sanitary sewers and combined sewers in the City of Hazleton and Borough of West Hazleton. Each municipality will retain ownership and maintenance of their respective separated storm sewer systems. The Sewage Transmission Fees are used to fund the activities of the Collection System Division of the GHJSA. These activities include but are not limited to routine maintenance of the sanitary sewer lines, identification and repairs of trouble areas in the system, correction of inflow and infiltration into the sanitary sewer lines, and separation of combined sanitary and storm sewer lines in some areas. The work will be performed on GHJSA owned collection and conveyance lines in the City of Hazleton and Borough of West Hazleton. A list of projects completed by the Collection System Division is available for download below.